Awesome Almond Butter Rocky Road – Paleo Friendly! Brace yourselves and hold on tight my little beauties because the road is about to get rocky! This awesome, paleo friendly treat is so simple and quick to create you shall be licking the bowl clean in no time. The two main ingredients are chocolate and almond butter. If your mouth isn’t watering at the thought of that, just wait until you hear about the other nuts and fruits that are stirred through to give it the rockiness……..you now have permission to drool! 1- Use a chocolate that has a high percentage of cacao. I used an 85% bar. 2- Use a pure Almond Butter. 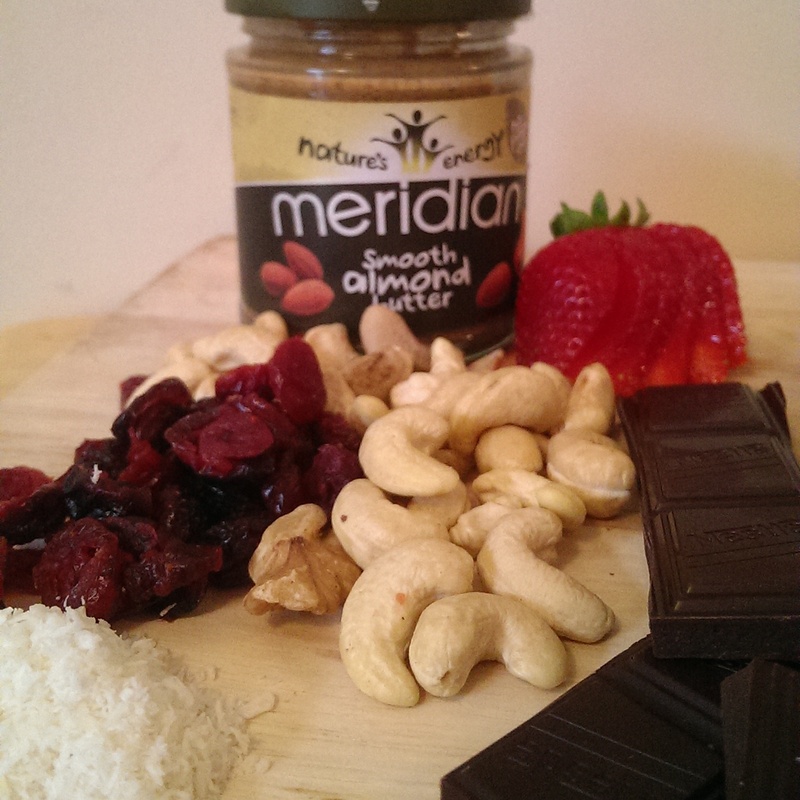 I used Meridian Almond Butter, which is made from 100% almonds and zero other ingredients. Meridian also have other nut butters available, including hazelnut and cashew, so feel free to experiment and substitute as you wish. -line a 2cm deep baking tray with baking paper. -Place a glass bowl over a saucepan of simmering water. Add the chocolate, almond butter, coconut oil, honey and melt together. -Once all melted take off the heat. Stir in the cashews, walnuts, cranberries and desiccated coconut. -Pour the mixture onto the lined baking tray and spread out evenly. -Decorate the top with the strawberry slices. -Pop in the fridge to set. Min 2hrs. Best to leave overnight. -Lick the bowl!! Unless you have super human powers to refrain from such activity. 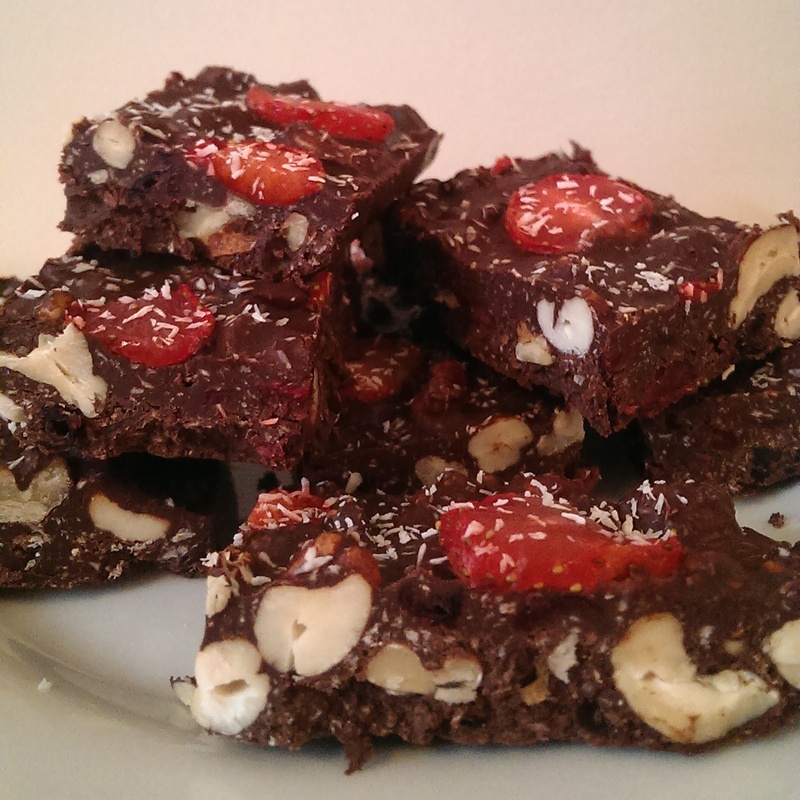 – Once the mix has set, remove from the baking tray and slice into squares. How easy was that? 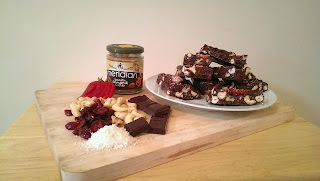 The joy with making Rocky road is that if you don’t have one of the ingredients, you can always substitute them for other things. So it is a great way to use up those opened nuts and half bags of fruit. If you make this or any of my other recipes, I would love to see your creations. Previous Cauliflower Houmous – Chickpea free!